Mahmoud Abbas will head an interim government until elections are held. Hamas officials threaten to split the group. Qatari mediation efforts between rival PLO groups Fatah and Hamas have succeeded and the twin terror organizations have signed a reconciliation agreement, it was reported Sunday. 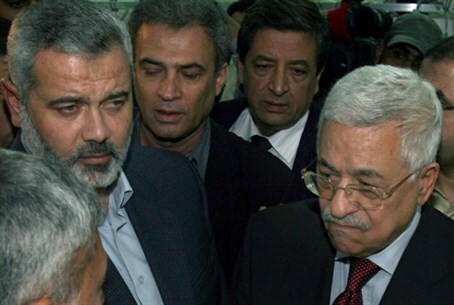 The impasse over the identity of the interim prime minister has been solved -- but there are already threats within Hamas to split the organization. The Qatari suggestion, which was accepted by both parties, was that Palestinian Authority (PA) chairman Mahmoud Abbas would head the temporary transition government until elections are held at a date that has yet to be set. The transition government will be composed of independent "technocrats." It will prepare the groundwork for elections for the presidency and for the legislative council. These had been delayed for procedural reasons. The ultra-leftist Geneva Initiative called the reconciliation "a diplomatic opportunity that may never be repeated" and called upon Israel to suggest "a serious plan that will test whether the united Palestinian leadership seeks peace." Al Arabiya news network reported Sunday that senior official sin Hamas are threatening to split the terror group in two, because they do not accept Mahmoud Abbas as prime minister, even in a transitional government.